Wandering Whistling Duck have returned to the wetlands after an absence of a few months. They are so well camouflaged amongst the waterlilies that I wouldn’t have noticed them if I hadn’t been scanning around with the binoculars. Grey and Rufous Fantail have arrived for their winter residency; it is always delightful to watch them hunting for insects. We have recently enjoyed regular close sightings of Gould’s Bronze Cuckoo on the edge of the rainforest along the creek where there is usually much activity in the morning sun. And there are lots of butterflies about, especially when there is a burst of sun in between showers on a a wet day. 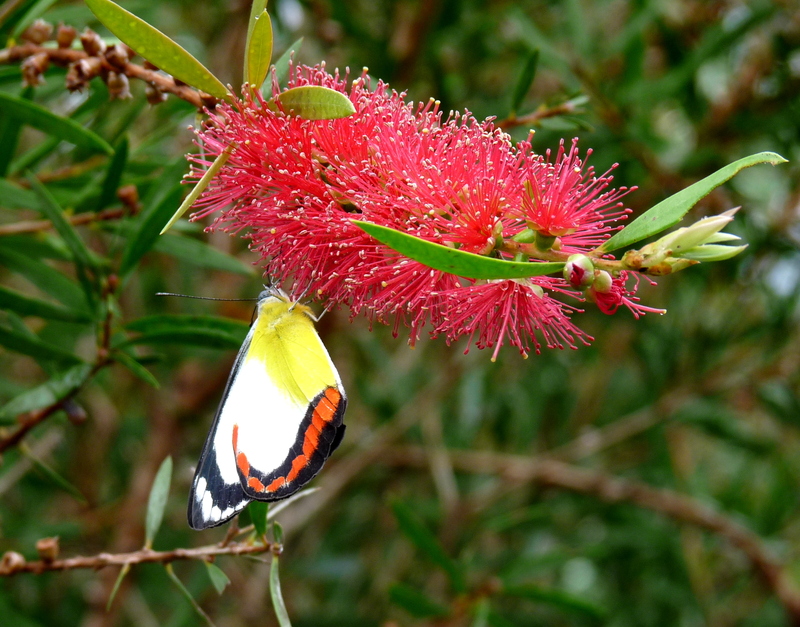 The photo shows a Union Jack butterfly (Delias mysis mysis) feeding on Melaleuca blossom. This entry was posted in Bird Observations, Butterflies, Insect Life. Bookmark the permalink.